Huntsham, rare breed, Longhorn beef was chosen by Heston Blumenthal for his television series ‘Perfection’ as the best beef available in Britain. 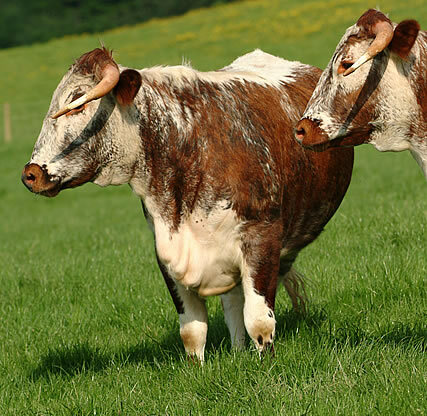 Huntsham beef comes from the Huntsham herd of Longhorn cattle. This old-fashioned breed was developed 200 years ago and was the breed which made England famous for its fine roast beef.Longhorn beef is now a rare breed and has been largely forgotten, but the quality of its meat remains outstanding. Our Longhorn beef is hung for nearly five weeks so that the fine-grained, well-marbled meat reaches its ideal maturity and full potential. The carcase is then butchered in such a way that all customers get equal proportions of expensive roasting cuts and less expensive diced and minced meat.